If you have more ideas about ISA Server 2004 Enterprise articles, please let me know and I will check if your idea could be part of a new article. Before we start installing the Configuration Storage Server on DEN-CSS-01, you need to know some basics about ISA Server 2004 Enterprise features and terminology. For this first article you have to know what a Configuration Storage Server is because we will install a Configuration Storage Server (CSS) on DEN-CSS-01. 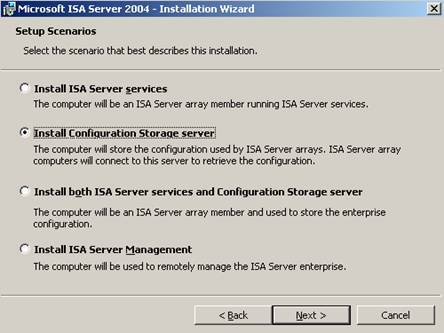 ISA Server 2004 Enterprise uses Configuration Storage Servers to store the ISA Server Array Firewall Policy. A single Configuration Storage server can store Firewall Policies for multiple ISA Server 2004 Enterprise Edition Arrays, and these Arrays can be located anywhere in the organization. The Configuration Storage Server uses ADAM (Active Directory Application Mode). ADAM is an LDAP compliance directory and runs as a non-operating-system service and it does not require deployment on a domain controller. It is possible to run multiple instances of ADAM on a single server, and each instance can be configured independently. It is possible to deploy a Configuration Storage Server on a Domain controller, on a Member server, on ISA Server itself or on a Server in a workgroup. Every deployment Method has it Pros and Cons. In this scenario we will deploy the Configuration Storage Server on a Windows Server 2003 Member Server. Insert the ISA Server 2004 Enterprise CD and follow the installation instructions. You must choose to Install Configuration Storage Server. This will install an ADAM-Instance on this computer which will be used to store the configuration of ISA Server Arrays. ISA Server Array Members will connect to the Configuration Storage Server to receive the configuration. If you choose Install Configuration Storage Server you can see in Figure 2 that only the ISA Management Option and the Configuration Storage Server will be installed. On the next page we must select create a new ISA Server enterprise (Figure 3). 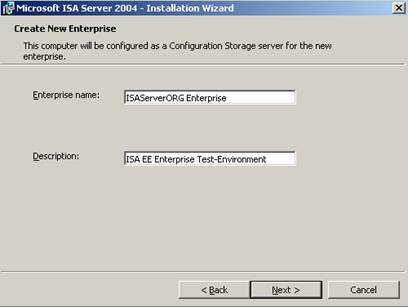 This configuration option creates a new ISA Server Enterprise during the installation. Figure 4 shows a warning message that Microsoft recommends only deploying a single Enterprise in your Organization. Multiple Enterprises could be hard to manage. You can deploy multiple Arrays within one ISA Server Enterprise. The next step (Figure 5) is to name the new ISA Server Enterprise and enter a description for the new Enterprise. 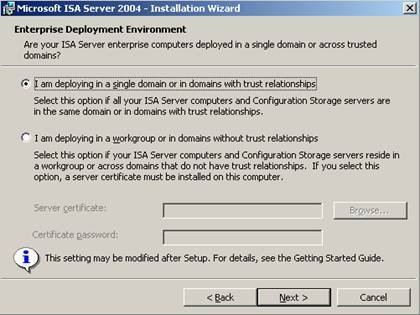 If you are using ISA Server 2004 Enterprise in a single domain or in domains with trust relationships, you must choose the Setup Option I am deploying in a single domain or in domains with trust relationships. ISA Server will use Windows authentication for authentication purposes. If you are using ISA Servers and Configuration Storage Servers in different domains without trust relationship or in a workgroup deployment, you must use certificates to establish a secure communication channel for authentication purposes. If you are using certificates in a workgroup deployment you must use this tool to update ADAM account settings so that they do not expire. 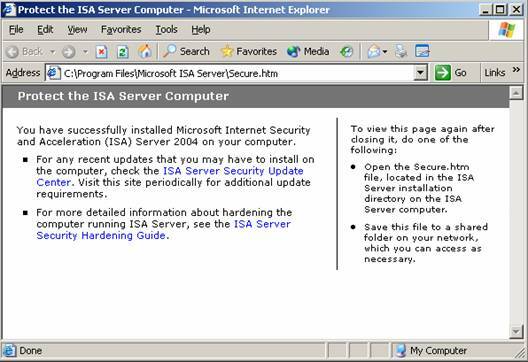 After finishing ISA Server 2004 setup, the setup opens as a last step, a website from the ISA Server 2004 installation directory, which will guide you through additional steps how to secure your Windows / ISA Server installation. 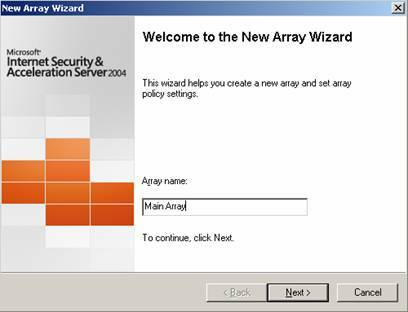 Before we are going to install the ISA Server 2004 Array members, we must create a new ISA Server 2004 Array. 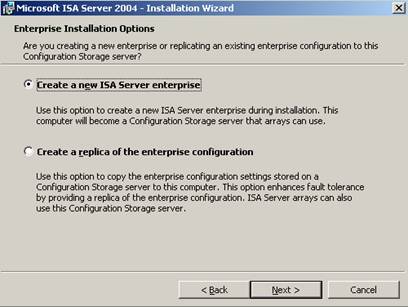 To create a new ISA Server Array start the ISA Server 2004 management console on the Configuration Storage Server, navigate to Arrays and create a new ISA Server Array. We will name the Array MainArray (Figure 9). The next page (Figure 10) asks you to enter the ISA Server Arrays DNS name. You must enter a DNS conform FQDN (Fully Qualified Domain Name). You must create a corresponding A-record in DNS, so that Firewallclients and Webproxyclients can resolve the Name correctly. If you are using NLB you must enter the VIP (VirtualIP) as the IP address in DNS. I will give you more information about implementing NLB in another article. 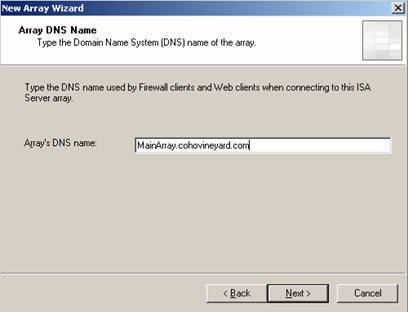 We will enter the Array's DNS name MainArray.cohovineyard.com. The next step is to specify which Enterprise Policy to apply to this Array. Because we don't create another Policy, we must use the Default Policy (Figure 11). 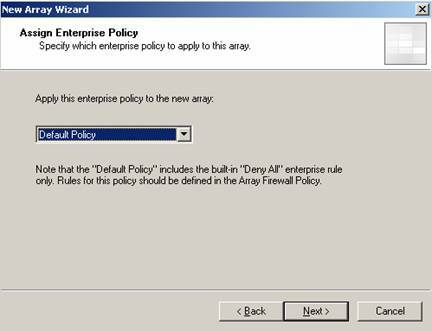 It is possible to create new Policies every time and associate this new Policy with an Array after installation. I will show you how to do this in another article on www.isaserver.org. In the following picture you can select the types of Array Firewall Policy rules that can be created for this Array (Figure 12). This is a great option to limit the creation of rule type at Array level. After reading the summary of the new Array Wizard click Finish. ISA Server now creates the new Array. This task can be time consuming (Figure 13). Click Apply (Figure 14) and you have successfully finished the new Array installation. As you know, ISA Server 2004 uses System Policies which allow some communications between ISA Server, Active Directory Servers, DNS Servers, DHCP and many more. 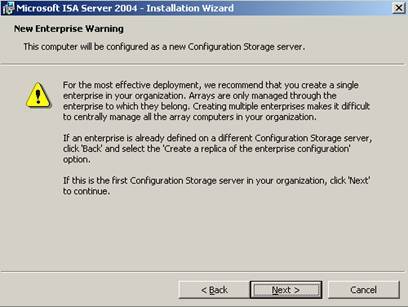 You must modify the System Policy to allow the ISA Server 2004 Array Members to access the Configuration Storage Server. 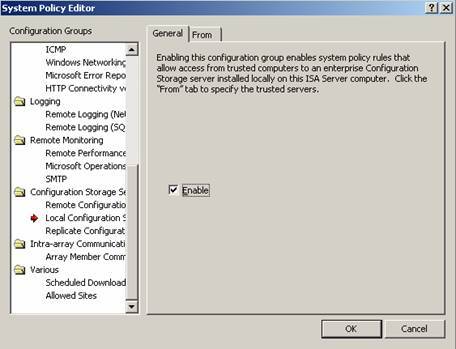 If you want to know more about System Policies, read Tom Shinders article "The ISA Firewall's Default Post Installation System Policy and Configuration" at the following website: http://www.isaserver.org/articles/2004systempolicy.html. You can find these settings in the System Policy Editor under Configuration Storage Server – Local Configuration Storage Server Access. Click Enable (Figure 15). 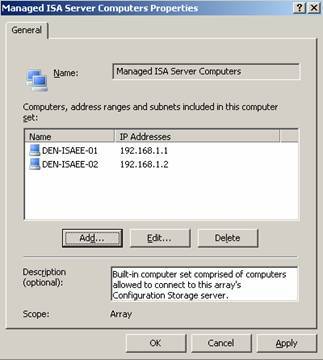 Click From (Figure 15) in the System Policy Editor – select Managed ISA Server Computers and click Add to enter the names and IP-addresses from the two ISA Server 2004 Enterprise Array members. Click Apply to save the configuration changes. We are now ready to install the Firewall services, but this will be part of another article on www.isaserver.org. This was part one of this four part article and you have seen how easy it is to deploy a Configuration Storage Server in your enterprise. 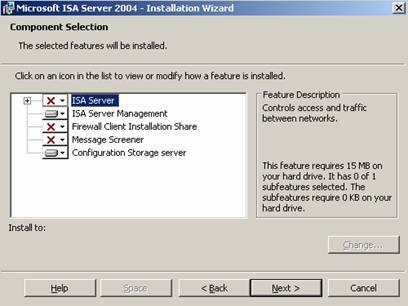 Part two of this article series will show you how to install ISA Server 2004 Array Members with ISA Server 2004 Firewall services.